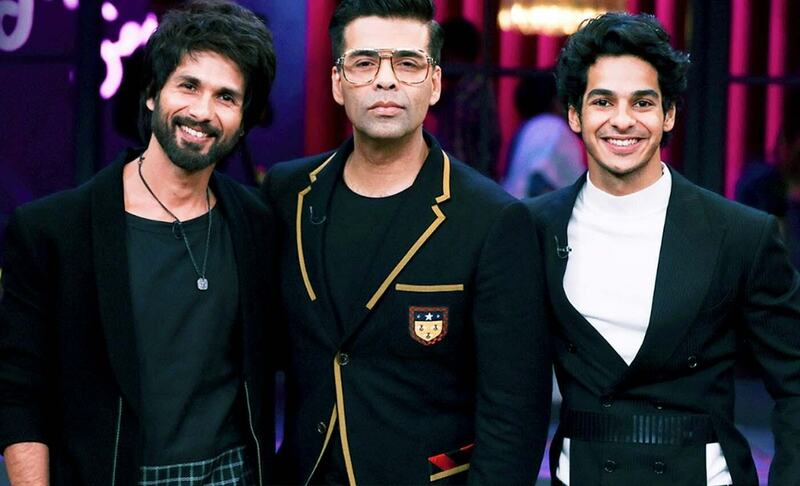 Karan Johar had one of the controversial episodes of the season with cricketers Hardik Pandya, KL Rahul and after such a drumming weekend he is back with another sibling duos, the ever charming Shahid Kapoor and his younger look-alike and talented newbie Ishaan Khattar. Ishaan started his career with Majid Majidi’s Beyond the Clouds and went on to act opposite Janhvi Kapoor in Dhadak, which was produced by Karan Johar himself and had his fist debut on KWK 6. While the three dapper and stylish men in the house lit-up the screen with their expensive, trendy and fashionable looks where Karan, unsurprisingly, slayed a Gucci jacket with yellow piping tracing the edge of his coat, Shahid, balancing between latest trends and comfort, wore a black and white ensemble from Pawan Sachdeva’s new collection Tranquility and Ishaan looked his sauve best in Anuj Madaan’s autumn winter collection Carbon Salt and Christian Louboutin slip ons. Here some of the highlights the ‘brother in arms’ gave us in this episode, also at the risk of stating the obvious. Many reveleations were made on the couch but the bigger revelation surprisingly came from Ishaan when he admitted that he has dated an older woman. During a game session, Karan asked both the chocolate boys of Bollywood if they have ever dated an older woman. To Karan’s shock Shahid did not take the coffee shot, but Ishaan gulped one revealing he has dated a 45-year-old woman. When it was time for the prickly questions about ex-girlfriends Kareena Kapoor Khan and Priyanka Chopra Jonas, Shahid didn’t dodge a single question on either of them. When Karan asked what suggestion would he like to give Nick Jonas he said, ‘Never back down, buddy. You’re with the original Desi girl,’ and he also picked Kareena as the more talented one among the two while he called Priyanka the more hard-working one. Only Shahid could have been this upfront about instances of their professional failures on Karan’s couch before. ‘I don’t think anybody has had as many flops as I’ve had. Actually, I had one month where I had three flops. There was Shikhar, there was Life Ho Toh Aisi and then there was Dil Mange More. When Johar asked him if he keeps a count of his flops, the actor said it is hard to keep count after 10 flop films and chuckled.